I enjoy your thoughtful, insightful reviews on the current state of television. Count me among the fans who would like to see "The Honeymooners" return. Although I have seen many of the episodes dozens of times, I still find them outrageously funny, fresh and superbly acted. My hope is that enough people will write to make Channels 17, 29 or 12 take notice. PS. : I take issue with your reference to "Dr. Who" as a "cheesy drag." 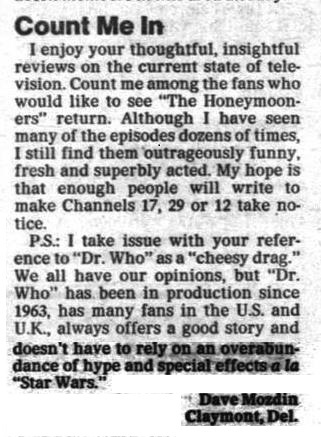 We all have our opinions, but "Dr. Who" has been in production since 1963, has many fans in the U.S. and U K., always offers a good story and doesn't have to rely on an overabundance of hype and special effects a la "Star Wars." APA 6th ed. : (1984-03-19). Count Me In. Philadelphia Daily News p. 42. MLA 7th ed. : "Count Me In." Philadelphia Daily News [add city] 1984-03-19, 42. Print. Turabian: "Count Me In." Philadelphia Daily News, 1984-03-19, section, 42 edition. This page was last modified on 27 March 2019, at 20:48.